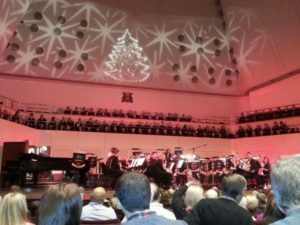 The Nottingham Harmonic Choir perform two Family Carol Concerts each year, usually on or around the weekend immediately before Christmas. When not joining forces with the band, or leading the audience in some of the familiar Christmas Carols, the choir performs beautiful, though perhaps less familiar, carol settings ranging from exquisite and intricate baroque pieces to the contemporary favourites by composers like Morten Lauridsen and John Rutter. The Thoresby Colliery Band is one of the most exciting brass bands in Europe, and has won countless accolades for its inspirational playing. Even if you think you don’t like brass bands, this one will convert you. Over the years they have played pieces ranging from Frosty the Snowman to Rossini’s William Tell Overture, Tchaikovsky’s 1812 Overture and Wagner’s Procession to the Minster. If you get seats close enough to watch their percussion section, it is an amazing sight and sound. You are guaranteed to go home from this concert with a warm glow inside and a feeling of the fun of Christmas. This is a review by Tanya Louise at Nottingham Live.